Here’s a look at what’s coming out from DC Comics for October 2015. A full list of solicitations is available here. A few books have been spun off from “Convergence.” One such book is “Superman: Lois & Clark,” starring the pre-New 52 Superman and Lois Lane. They’re still married in this series, but their son (born during “Convergence”) is now a grade-schooler. The “world not their own” I assume refers to the continuity changes “Convergence” wrought, including to their post-Crisis Earth… and not Lois and Clark stuck on the New 52’s Prime Earth. It also looks like pre-New 52 Supes is losing his red shorts/getting a redesigned belt as well, based on that cover (if that’s him?). On the plus side, 90s Superman writer Dan Jurgens is writing this series, so everyone should be (editorial meddling aside) much more in character versus the “mainstream” New 52 Superman books. October is Halloween, and we’re getting a “Wonder Woman ’77” special, including one Halloween-themed story and several others. “Bat-Mite” sees an appearance by minor 60s comedic heroes the Inferior Five, who pre-Crisis were deemed very late in the original multiverse game (while “Crisis On Infinite Earths” was in progress) to live on the parallel world of “Earth-12.” Earth-12 was basically the home of all of DC’s old humor books that didn’t involve funny animals (that’d be the Zoo Crew’s Earth-C) and otherwise weren’t shown set on Earth-1: “Bob Hope,” “Jerry Lewis,” and a few others. The Inferior Five were a group of bumbling superheroes that were the offspring of more competent ones. 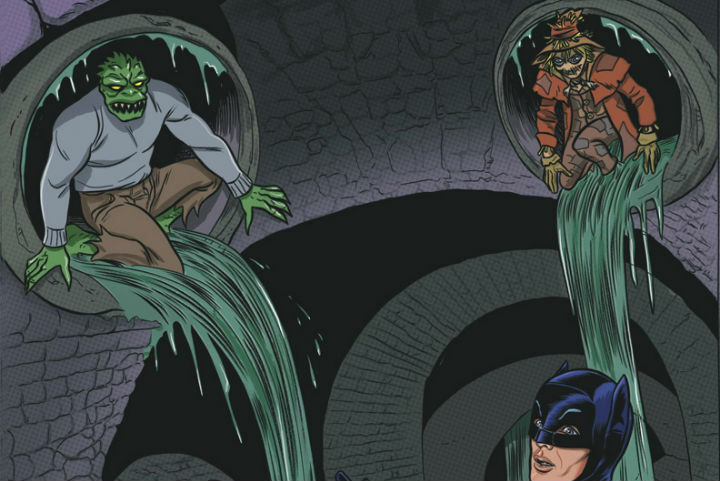 Finally, “Batman ’66” is bringing on board “1966” versions of the Scarecrow and Killer Croc.